James Bond catches local governor Pleydell-Smith's secretary, Miss Taro, eavesdropping on his conversation and, never one to turn down a golden opportunity, arranges a date. 007 makes the most of Miss Taro's hurried plan to keep him at her house in the mountains just long enough for his assassin to arrive. Bond, naturally, finds the perfect way to kill the time. Miss Taro: What should I say to an invitation from a strange gentleman? James Bond: You should say yes. Miss Taro: I should say maybe. Miss Taro is secretly working for SPECTRE at Government House in Kingston, and twice tries to kill Bond but fails. She arranges to meet 007 at her apartment in the mountains. En route, Bond is menaced by the assassins who pursue him in a hearse. Bond escapes under a crane parked in the road as the pursuing hearse plummets over a cliff and explodes. Taro is startled to find Bond on her doorstep and later takes a call from someone who wants her to keep him there for a couple of hours. After making the most of the interlude, Bond talks her in to eating out but when the "taxi" arrives for them, she is bundled into an awaiting police. Bond had Taro set up to be arrested by the local superintendent all along. He stays in Taro's house until her mystery contact arrives - Professor Dent. 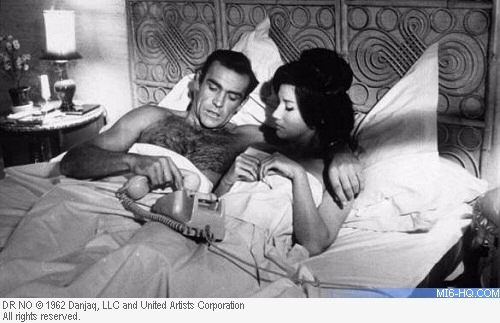 The professor fires several shots into the bed in which Bond has arranged some pillows so as to make it appear as though he is sleeping there. Bond takes Dent captive and when he tries to escape, Bond cold-bloodedly guns him down. British actress Zena Moyra Marshall was born on New Year's day in 1925 in Nairobi, Kenya. Her father died when she was young, and her mother married a landowner in Leicestershire, where she spent her early years. Her mother’s family were French, and Zena’s dark beauty would later lend itself to a series of exotic screen characters. She attended St Mary’s Roman Catholic school, Ascot, Berkshire, trained at the Royal Academy of Dramatic Art, and worked with Ensa, the Entertainments National Service Association during the Second World War. A noted beauty, she was courted by Prince Alexander of Yugoslavia and she once dined with President Perón. In 1947 she married the band leader Paul Adam, though the union was brief. Her first big screen role came as a bit part (lady-in-waiting) in the Gabriel Pascal produced 1945 "Caesar and Cleopatra" that starred Claude Rains and Vivien Leigh in respective title roles. It would be 17 years before Marshall had her real brush with James Bond, but the film also featured an uncredited debut appearance from future-007 actor Roger Moore as a Roman Soldier. Marshall shot to fame in the role of Chinese SPECTRE agent Miss Taro in the debut James Bond film "Dr No" in October 1962. Although it took a couple of years for worldwide audiences to catch on to the 007 phenomenon (the film was not released in the USA until May 1963), and thanks to re-releases of the early films when Bondmania struck with "Goldfinger" and "Thunderball", Marshall's scenes with Sean Connery became part of cinema history. Although not the first conquest for Bond, Miss Taro was the first 'bad girl' of the series. 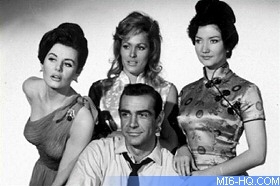 Above: Zena Marshall with Sean Connery (top) and 007's other leading ladies in "Dr No": Eunice Gayson and Ursula Andress. Contributing to a DVD commentary many years later, Marshall made it clear that she thought the "Dr No" script was nothing special till director Terence Young introduced an element of humour. She also remembered that it took three days to shoot her landmark bedroom scene with Connery and that she found it very difficult to spit in his face when handed over to the police. Marshall was caught up in some controversy when her picture, in skimpy dressing gown and toweling robe, appeared in a controversial series of James Bond photo cards issued with bubblegum in 1964 by a company called Somportex. The cards also included other early Bond girls in various states of undress. One MP claimed they were “a disgusting and disgraceful corruption of young children”. The cards were withdrawn and replaced with a set with more emphasis on guns and violence, which seemed to please everyone. Both sets are now worth hundreds of pounds. Following her most famous role, Marshall also appeared in popular films "The Switch" (1963) and "Those Magnificent Men in Their Flying Machines" (1965). 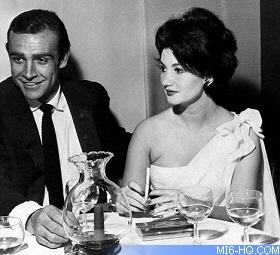 She came back in to the Bond fold for an appearance as herself in the TV special "The Incredible World of James Bond", a behind the scenes look at the Bond phenomenon during the release of "Thunderball". TV roles in the 60's included episodes of "Invisible Man", "Danger Man" and "Dixon of Dock Green". Like many of the early Bond girls, she retired from the screen to focus on domestic life. Her last big screen credit was the quirky 1967 sci-fi flick "The Terrornauts". Marshall was married to Ivan Foxwell in 1991 until his death on 16th January 2002. In recent years, she proved extremely popular at Bond reunion events and screenings. After suffering a short illness, Zena Marshall passed away on Friday 10th July 2009 at the age of 84. Her cause of death was listed as cancer.